People who have problems with their feet, ankles and knees often think they may need orthoses but are unsure where to go to get treatment. Whilst most people know that a podiatrist treats foot problems they are unaware that ORTHOTISTS specialise in the clinical asessment and provision of orthoses. Orthotists are trained exclusively in the clinical prescription, manufacture and fitting of orthoses. Orthotists typically manufacture the orthoses themselves with equipment they have onsite. They are able to make modifications to the orthoses whilst clients wait. Often other allied health professional such as podiatrists send the orthoses off for manufacturing by someone else. If adjustments need to be made the client will often have to wait several days for the orthoses to be returned. 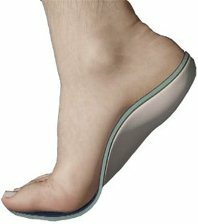 At OPS, orthoses are made using a cad cam machine that takes an exact imprint of your foot to ensure a correct fit. Our Orthotists make semi-rigid orthoses. These softer inserts are much better for clients, especially those who play sport where impact is high and shock absorption is required, without loss of correct foot posture. Most Health Insurance funds will provide a rebate for orthoses.